Squirrel on the roof top. Blue sky background with copy space.These bandits generate an awful lot of damage for something so cute. While you may already be familiar with their dumpster-diving ways, these creatures have also been known to shimmy along downspouts. These antics have the potential to cause headache-inducing problems for homeowners. 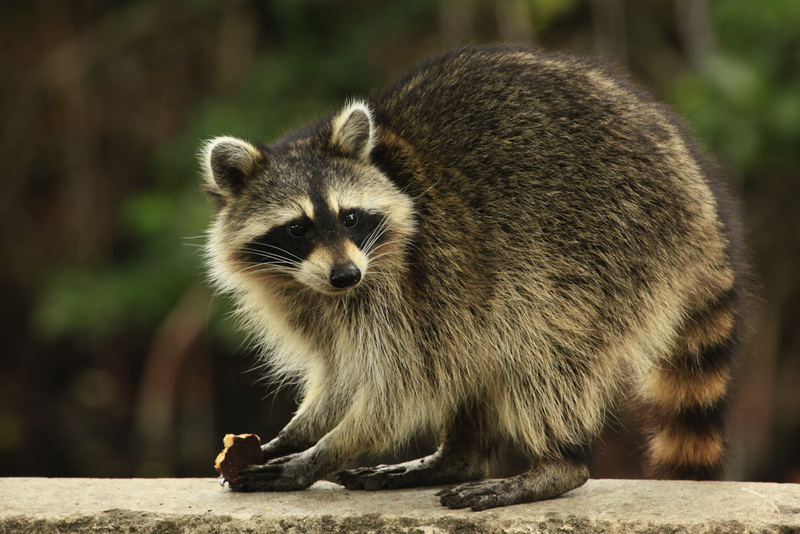 For example, because of their weight, raccoons can pull spouts away from the home, damaging the exterior, the spouts, and anything the spouts happen to fall onto. Raccoons will also generate damage on the roof itself. They leave behind signs such as torn roof shingles, damaged soffits, and chewed fascia boards. Often the damage happens around vents. Raccoons that get inside your attic can wreak additional havoc in the form of gnawed wires, ripped or flattened insulation, and more. 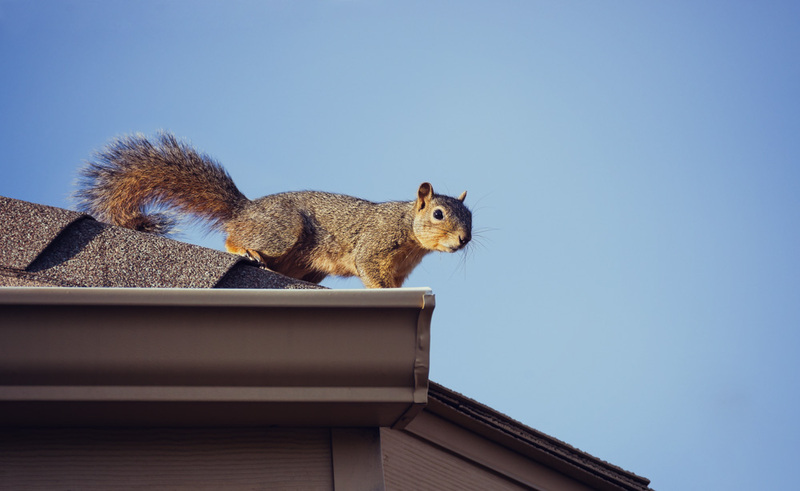 It’s common for squirrels to enter a home through the roof, often via ridge vents, uncapped chimneys, gaps in fascia, or gaps in siding. Once inside, they can take up residence in your attic or crawl space–and even crawl through the walls. Considering their small size, squirrels can cause a surprising amount of damage to your home, from destroying insulation to chewing wires to damaging drywall. 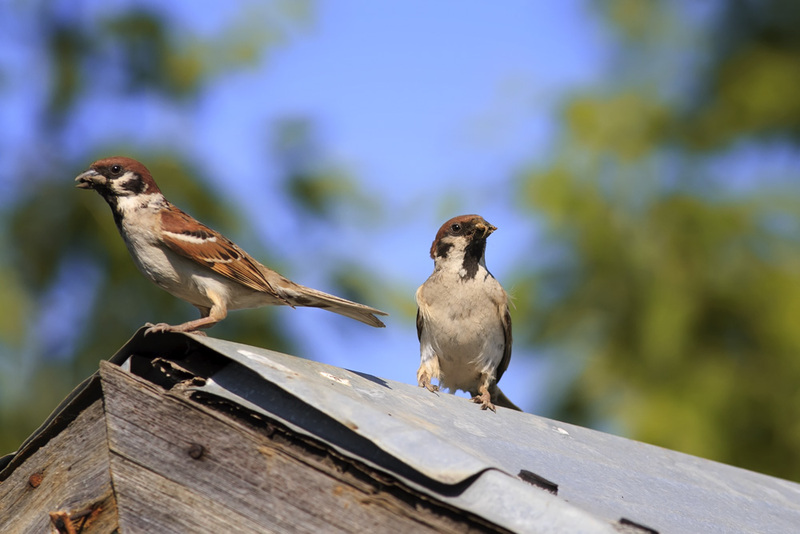 Yes, our feathered friends can cause roof damage as well. Birds make nests in gutters and drains, causing blockages that allow water to pool around your house’s foundation. Nests can also block vents, which prevents air from flowing through the attic properly. In addition, birds’ highly acidic droppings will eat away at tar-based roofing materials, like asphalt shingles. This can shorten the roof’s lifespan and its ability to protect your home’s interior from the elements. 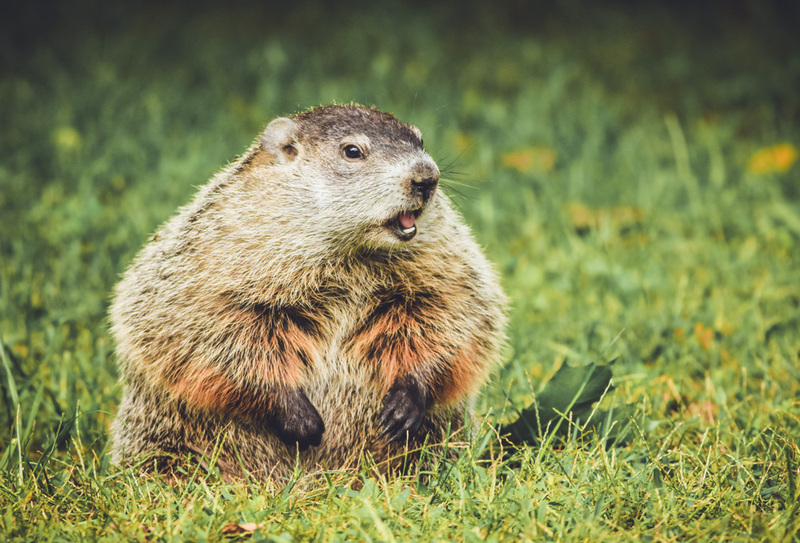 Groundhogs dig extensive burrows; if those burrows extend around your home’s foundation, they can generate significant damage. The burrows allow water to pool around the foundation, causing the serious potential for damage and collapse. What’s more, groundhogs will also gnaw on siding, wooden decks, and front porches. If the critters are still making themselves at home in your home, consult an animal control specialist for removal advice or assistance. Once you’ve served the eviction notice, talk with an experienced roofing, gutter, or siding contractor to repair the damage and help prevent future incursions. Simple fixes, such as repairing gaps or replacing shingles, can strengthen the exterior weak spots that give critters of all sizes an open invite into your home. While many homeowner policies exclude vermin damage, it’s still a wise idea to call the insurance company to find out what your policy covers. If it covers vermin damage, Best Contracting will help you navigate the claims process and get the repair done right. Not covered? No problem. You may qualify for our no-interest financing option. Contact Best to schedule a free roofing, gutter, or siding inspection in Lancaster, West Chester, Downingtown, or Coatesville. We also serve other areas of PA, NJ, MD, and DE. "I was impressed with everything from the day we met at the home show in Harrisburg. I have already begun recommending this company to everyone I talk to. Great professional people, I look forward to having them back for more." – Steve & Lois L.
"Ray and his crew have been very professional, personable, and easy to work with. We feel communication has been exceptional. The work is excellent." – Dennis & Elaine D.
" Pleased by the way we were treated. Best helped us in every way possible. We would recommend Best Contracting to everyone." "Excellent customer service and communication from Dave B. and Ray. The people who came to make the storm repairs were very courteous. In this day and age, it is very difficult to find a contracting company to work hard for you, but we found it with Best Contracting." – Patti & Mike S.